The perfect gift for Christmas, a birthday or any special occasion, give the perfect present of choice with gift vouchers for The Toy Barn. 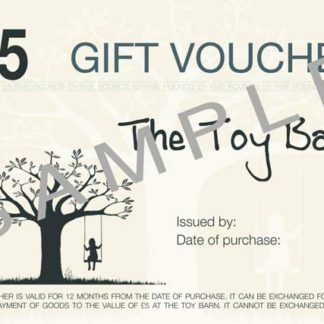 The Toy Barn gift vouchers are valid for 12 months from the date of purchase. The Toy Barn £10 gift voucher can be exchanged for payment or part-payment of goods to the value of £10 at the toy barn. It cannot be exchanged for cash and consequently change cannot be given. Terms and conditions will not affect your statutory rights.